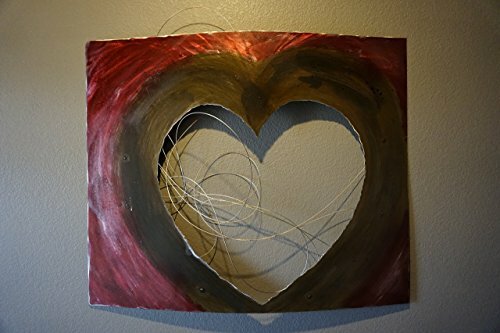 Wall Decor - Hand made one of a kind kind abstract metal art piece. Heart with movable wires - "Forever Changing Heart"
Hand made one of a kind kind piece. This is an amazing functional piece. This one is named "Forever Changing Heart" Has intersecting wires attached so you can change the art daily, weekly or how ever you feel. Size is 36" wide x 30" tall. Stands off the wall roughly 2.5"" from the main Wall. I enjoy making pieces that can be moved different ways or changed to the mood of person or place. Comes with many different red and green patinas to crest a variety of colors and even has silver sparkles dusted in certain areas. If you have any questions about this product by Sacrifice Studios, contact us by completing and submitting the form below. If you are looking for a specif part number, please include it with your message. Wall Decor - Hand made one of a kind kind abstract metal cross with spikes. Original Fluid Acrylic Abstract 10" x 20" on Stretched Canvas "Other Worlds II"
By Only Art Studio, Inc.